— Short-term vacation renting has been growing in popularity since the dawn of the sharing economy. VRBO started in 1995, but it was the start of HomeAway (2004) and Airbnb (2008) that forever changed the way the world looks at real estate. Everyone wants a piece of the pie because it can be lucrative. We receive daily an ever-increasing amount of new inquiries about which properties for sale might be suitable to rent out as short-term vacation rentals. In response to the huge demand, we compiled the most comprehensive guide to Honolulu short-term vacation renting: Guide to Honolulu Condotels and Short-term Rental Condos. Search all available condotels for sale. Maximum rental income potential – Short-term vacation renting with less than 30-day rental terms has the potential to generate significantly more rental income compared to longer-term 30-day minimum rental terms. Maximum rental flexibility. – You control the booking calendar and can block days to best fit your vacation plans. Enjoy the unit for your personal use between guest bookings. See our related article Waikiki’s Condotel Reality analyzing and comparing different sample income statements. Property owners get inspired by success stories of how others have turned their properties into cash cows. But every opportunity comes with certain risks associated. Ignorance is not bliss. It can get you in trouble if you don’t know some basic rules, or worse, if you blatantly disregard them. The vast majority of residential neighborhoods and condo buildings do not allow short-term vacation renting (rental terms shorter than 30 days). b) the building house rules do not prohibit short-term vacation renting. 1) The individual condo unit must have a NUC (Non-confirming Use Certificate), or..
2) the condo building has an ongoing active hotel operation and the property is exempt from requiring owners to hold a valid NUC, as per an unofficial list from 1990 by the Dept of Planning & Permitting, or..
3) the property has a legal Bed & Breakfast license (for single-family homes). The city has not issued any new NUCs and B&B licenses since 1986. All existing NUCs need to be renewed every even-numbered year. Here is a list of current NUCs. The buildings that are exempt from NUC requirements are listed in our Condotel Guide. This is basic stuff, except there are differences of opinions and entitlement issues. Consider the case of Waikiki Lanais, a popular Waikiki condo building. The underlying zoning is apartment precinct which prohibits short-term vacation renting. ‘Lawful use’ and ‘consistency with zoning regulations’ is explicitly stated. “A resident advised the board that short-term vacation renting is not permitted. The board of directors requested and received a DPP letter confirming that short-term vacation renting is not allowed. 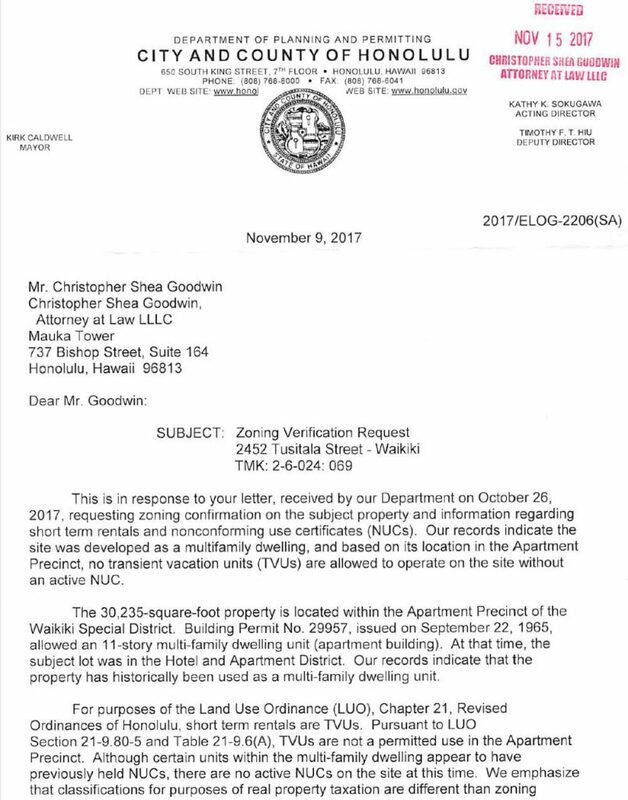 Waikiki Lanais owners were sent a copy of the letter. The board of directors notified owners of several planned actions to enforce the rules, and the DPP began visiting the building regularly issuing citations. The board received two lawsuit threats from two firms and went to mediation with one. Board actions were suspended while waiting for the mediation results. The mediation failed. Supposedly, as of this writing multiple properties are still being advertised and pro vacation renting owners are working on gaining majority interest on the board of directors. Oops! “Don’t take away my secret golden goose.” – If you bought a condo at the Waikiki Lanais thinking that short-term vacation renting is allowed because everyone else is doing it, then you might have bought on false assumptions. Just because everyone else is going faster than the speed limit does not mean you can’t get a ticket. Perhaps it is prudent to check your source and ask better questions. Have you considered the possibility that city zoning rules have greater jurisdiction, overriding the building documents and not the other way around? Drinking Coke Zero does not cancel the calories of donuts. Of course, that is only a matter of opinion, subject to an attorney finding some loophole or precedent to argue otherwise. We are not attorneys and we take no sides in the ongoing dispute. Instead, we are committed to excellence in providing real estate updates to help you with your real estate decisions. Always check with your favorite qualified legal counsel. For the record, since day one we have been advising all our clients that short-term vacation renting is not allowed at Waikiki Lanais. 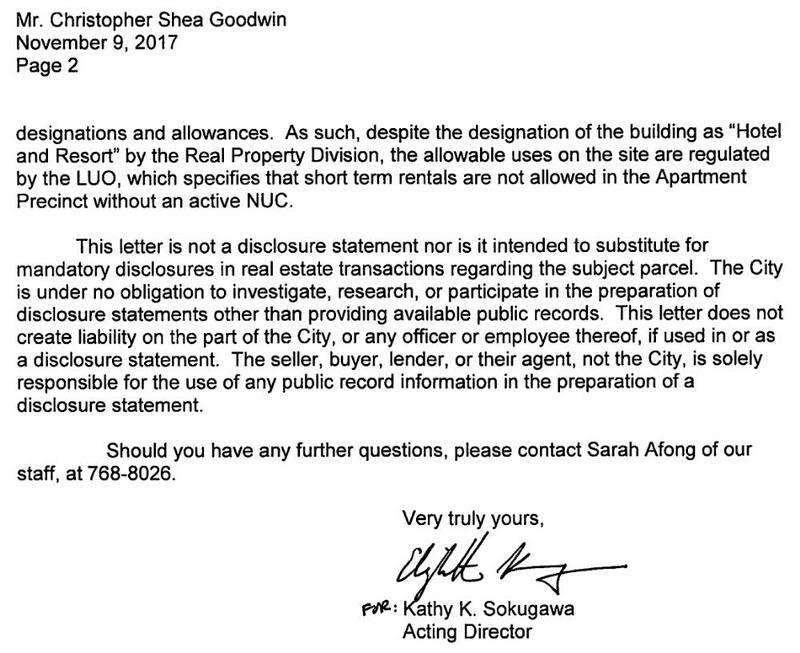 It has baffled us for years that the board of directors in the past blatantly allowed and actively participated in short-term renting and got away with it. I personally recall a conversation with a former board director that appeared to be in complete denial. There are several other Waikiki buildings with similar dynamics! As of this writing, it seems the Waikiki Lanais’ board might have wised up and is trying to act in accordance with the zoning law but poked a couple of beehives by doing so. Yet most recently, the DPP compliance office reportedly has taken a stance of “not wanting to police on behalf of the board any longer (!? )” – Could the lack of city enforcement fuel a false sense of security and entitlement among owners operating illegal short-term vacation rentals? Check a recent article about Hawaii’s tourism economy and illegal vacation rentals. We leave the outcome up to the attorneys to resolve the issue for the Waikiki Lanais condo owners, the board of directors, and the government offices. Until then, let cool heads prevail and buyer beware. May you balance the rights you deserve with the responsibility you must take. We love to read your civil and enlightening thoughts in the comment section below. If you are thinking about short-term vacation renting in Kakaako, think again. Kakaako condos are subject to the Hawaii Community Development Authority Rules, which limits rental terms to 180 days minimum. See related article Kakaako Rental Rules. Be mindful of the risk before you buy and proceed with caution. As mentioned, short-term vacation renting has the potential to generate significantly more income compared to long-term rental income. But that is only if tourism remains strong. Past performance is no guarantee of future results. Any unforeseen black swan shock event could drastically reduce your income potential. That event could be geopolitical, severe weather, terrorism, a viral health scare, or the next recession might cause tourism activity to fluctuate with little notice. Consider the case of the Ala Moana Hotel Condo. Extensively renovated in 2005 the hotel converted into the largest condotel in Hawaii with 1,150 condotel units. The majority of units are small studios with less than 300 sqft and no kitchen. This was before the 2008 – 2009 financial crisis. Investor condotel financing was readily available at 80% LTV, even for the units without a kitchen! Oceanview units started around $160K. Favorable 80% LTV financing prompted over 10,000 (!) potential buyers to line up in hopes of buying a piece of paradise. Cash flow at the Ala Moana Hotel was always marginal. But the building looks grand and elegant at a price point that seemed affordable for buyers to enter the market. In 2008-2009 tourism activity dropped in half as a result of the financial crisis. The income for ocean view units dropped as low as $600/mo while the fixed expenses (maintenance fees and property taxes) remained at ~$800/mo. Your marginal cash flow turned into a negative $200/mo. If you had a mortgage at 6% (yes, that was the going rate) as most buyers did, your cash flow turned into a negative $1,100/mo, every month with no relief in sight, even when the unit was fully booked! Oops. These small condotels are being bought by investors primarily based on the cash flow potential. When the cash flow diminishes or turns negative, the pool of buyers shrinks and property values drop. Ala Moana Hotel oceanview units dropped by a staggering 50% to as low as $80K (! ), cash purchases only. This price drop was significantly larger compared to the relatively benign 10% drop for the entire Oahu real estate market. No wonder the Ala Moana Hotel suffered a large number of foreclosures and lenders stopped lending entirely on condotels without full kitchens. Eventually, the Ala Moana Hotel recovered and cash flow has returned. As of this writing, ocean view units are selling again from about $250K upwards. But it took a long time to recover. What the DPP compliance office might lack in staff, willingness and ability, the tax department makes up for it in zest and vigor. Don’t take your responsibility of timely filing and paying the appropriate taxes lightly. There is no grace period with the tax office. 2.) 10.25% TAT on the TA Taxable Income (Gross Rent, before deducting expenses). GET is due on ALL gross revenue collected including cleaning fees, and anything else you might collect from the tenant, including any collected GET (except separately collected TAT). This is before you take out management fees, marketing fees, Airbnb service fees, maintenance fees and all else you would otherwise be able to deduct on your federal tax return. Many owners don’t get it right! What about if your condo is listed on the Airbnb website. Currently, the Airbnb site does not accommodate collecting separately for the GET and TAT. Let’s say a guest books your condo through the Airbnb site and pays $1,000, plus an additional $125 cleaning fee, and an additional $129 service fee. What you do as a property owner and vacation rental host is entirely up to you. Fair or not, we recommend filing and paying the appropriate taxes due in full and on time. GET and TAT under-reporting and late filing trigger stiff penalties. Don’t take chances. In doubt, always check with your favorite qualified tax professional or the HI Dept of Taxation 808-587-4242. Reciprocate Aloha! –‘Like’, ‘Share’, and ‘Comment’ below.